Is In-Flight Wi-Fi The End For Airline Magazines? Yesterday I was flying home from Augusta, Georgia on U.S. Airways and I noticed that the monthly edition of the airline magazine contained enough subsentence to occupy my short and rare flight. However, I realized that the magazine is almost totally irrelevant to the the airlines most profitable customers, frequent fliers, who stare at the glossy cover next to the safety card several times every month. Allowing travelers to have Wi-Fi access is a trend that has fliers more fliers disregarding the airline magazine and seeking carriers with Wi-Fi for more productivity and personal entertainment. Recently many of the major U.S. airline carriers have decided to go ahead with an investment in offering in-flight Wi-Fi for a fee, provided by the third party company Gogo, which operates under the parent company Aircell. The rationale behind the decision is that the airline executives believe their customers desire in-flight internet enough to chose one carrier over another, just for access to the internet. To support this belief, Mashable published the results from a recent survey, showing that over 3/4 of frequent fliers would change airlines to have Wi-Fi. 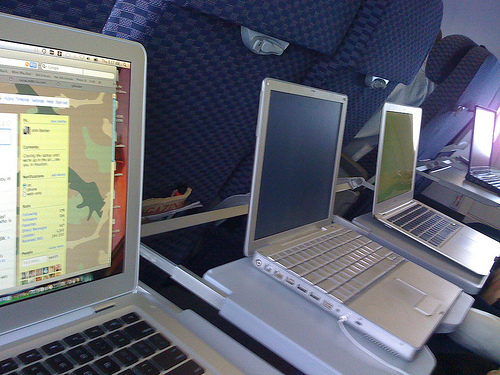 Now, in March 2010, most airlines have taken action and are implementing the service on select planes in their fleet, which operate routes that would have a high Wi-Fi demand. Now, why is this relevant to the airline magazines? For the passengers who subscribe to the Wi-Fi service, this will mean that their entertainment will likely be fulfilled via their Wi-Fi device, and not the magazine. The magazines exist now as a place for the airline to entertain their customers with reviews and promotions of destinations they serve and other mildly interesting travel articles. Meanwhile, the same information is available and more accessible with Wi-Fi, making the passenger likely to disregard any of the useful information within the magazine. As fewer passengers become interested and engaged in the airline magazine, its likely that advertising revenues will drop significantly because the advertiser will no longer be reaching their primary target. Instead, the primary target demographic which the advertisers are seeking will be on the internet. In other words, the advertisers will likely look to reach out to these travelers through a new media form, the internet! Thus, the internet advertising world will yet again trump traditional media forms, as travelers become increasingly digital and mobilized citizens. While the addition of Wi-Fi service in flight is not a guarantee that airline magazines will one day be discontinued, it is certainly an indicator that the advertisers should modify their ad budgets to attract those customers again, on the internet.